Accepta 2519 is a high performance condensate line corrosion inhibitor scientifically formulated for use in boiler systems and steam raising plant. Accepta 2519 acts to form a protective water repellent film on return line pipework. It also extends the life of condensate pipework by retarding the rate of ‘grooving’ by acidic condensate. Accepta 2519 has FDA approval for use where steam comes into contact with food. But the concentration must not exceed 3 ppm. Accepta 2519 also has FDA approval for use where steam sterilises surgical bandages, dressings and instruments. Limited to 2.4 ppm. Accepta 2519 contains a 4% solution of octadecylamine. Dose Accepta 2519 directly in to the feed water line or steam space. Dose Accepta 2519 by means of a high pressure positive displacement pump. Dose Accepta 2519 in proportion to feed water flow. A residual of 0.5 – 1.0 ppm should be maintained. 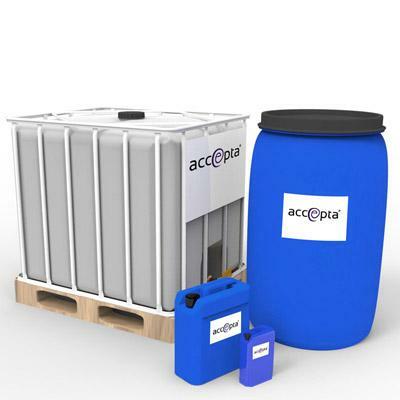 Accepta 2519 is NOT compatible with other boiler water treatment products. Always dose separately. For further technical assistance concerning Accepta 2519 please contact Accepta. Test amine level in condensate using Accepta amine test kit.